Ten years ago, Jeremy Byng was a student in the audience at Brethren National Youth Conference. This year, the tables turned as he took to the stage for the first time to lead worship at the annual Grace Brethren event, now called Momentum. It’s a responsibility that Jeremy, now a worship pastor at Grace Community Church, a Grace Brethren church in Goshen, Ind., doesn’t take lightly. It’s something he tries to do each time he is on the platform. 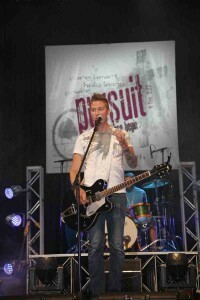 “Any time I lead worship, I want people to encounter God,” says Jeremy. He realizes that musicians, even worship leaders, are often placed on a pedestal. As a student, he was involved in the NAC (Nurturing Abilities for Christ) program, which is designed to encourage students in using their gifts and talents in service for the Lord. He appreciated the emphasis on learning, not on competition. Each week he fronts an all-volunteer band at one of two Sunday morning venues at the Goshen campus. He also leads worship for the Wednesday night youth group, is in charge of a Thursday night discussion and worship for college-aged adults, and plans a monthly worship night for the young adults. The Momentum conference, which is sponsored by CE National, continues through Sunday, July 18 on the campus of Cedarville University in Ohio. Click here to view reports from the week.